Robert Burns, one of the world's greatest poets, and Scotland's national bard, was born 250 years ago into a farming family at Alloway in Ayrshire in 1759. To celebrate the 250th anniversary of his birth, Royal Mail is issuing two new Special Stamps in a Miniature Sheet to coincide with the annual Burn's Night celebrations that mark his genius, held not just in Scotland, but globally from South Africa to Canada. The miniature sheet contains the four Scotland country definitives in a se-tenant block, and two new 1st class stamps. 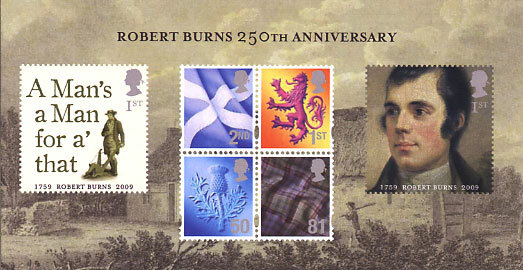 The stamp on the left features the title of the poem A Man's a Man for a' that with a detail from a copper plate engraving from a painting by James Sargent Storer Robert Burns turning up a mouse in her nest with his plough, while the stamp on the right is the famous portrait of the poet by Alexander Nasmyth. The background shows an engraving of Burns' birthplace in Alloway by James Sargent Storer. As well as the stamps, Royal Mail will be selling a first day cover and presentation pack. To see some other products and the special postmarks for the first day of issue visit our website.